An earthenware manufacturer at Newport Lane, Burslem. The Newport Pottery Co. Ltd was purchased in 1920 by the Shorter family, owners of the adjacent A. J. Wilkinson Ltd’s Royal Staffordshire Pottery. The pottery was used by its new owners for the manufacture of simple, inexpensive domestic ware and hotelware. From c.1927, the pottery became the base for the decorating shop and, later, the design studio used by Clarice Cliff to develop ‘Bizarre’ ware and the other shapes and patterns for which she is now well known. In 1941 the Newport Pottery business was concentrated with that of the other Shorter factories at the Royal Staffordshire Pottery, and the Newport Pottery buildings were diverted to war-time purposes. The Newport Pottery buildings was demolished shortly after the end of the war and post-1945 the Newport Pottery Co. Ltd operated from the other Shorter factories manufacturing its original domestic ware and hotelware. Clarice Cliff joined the firm of A. J. Wilkinson as an apprentice lithographer in 1916 and rose to be the head designer. She married the owner of the business, Arthur Colley Shorter in 1940 and was the final owner of the Shorter businesses following the death of her husband in 1961. She was both a modeller of shapes and a pattern designer and, from late-1927 to 1936, her studio at the Newport Pottery produced an almost unbelievable array of novel shapes and patterns. Remarkably, this enormous creativity was condensed into a relatively short period from the launch of the ‘Bizarre’ range in 1927 to the beginning of the Second World War in 1939. ‘Bizarre’ was the first, most prolific, and longest lasting of the Clarice Cliff ranges, but others followed including Fantasque, Biarritz and others. The ‘Bizarre’ mark introduced in 1927-28 was phased out in 1936 to be replaced by a more general ‘Clarice Cliff’ signature widely used on wares from the Newport and Royal Staffordshire factories. The period also signalled a change to a more conservative style as the strident patterns and extreme shapes of the period from 1928-1933 were replaced with more sober designs and a softer palette. Between 1936 and 1939 designs were gradually simplified and Clarice Cliff took a less direct interest in the modelling and decoration. Post-1945, Wilkinson’s Royal Staffordshire Pottery was modernised and production concentrated on printed ware for the export market. A small hand painting shop was re-established in 1946 and production of some of the most popular Clarice Cliff designs such as Crocus and Rhodanthe continued on a small scale. 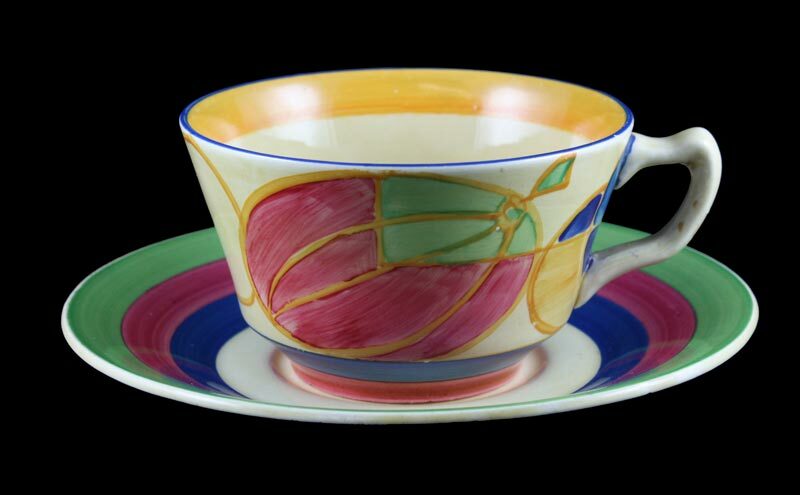 Post-1945 many Clarice Cliff shapes and patterns appear with a Royal Staffordshire mark. In the 1950’s Clarice Cliff worked with the new, younger, modellers and designers employed at A. J. Wilkinson Ltd including Peggy Davis, Eric Grindley and Eric Elliott, even so, the innovation of the 1930’s was never recaptured. Her husband, and effective owner of the business, Arthur Colley Shorter died in 1961 and Clarice Cliff-Shorter subsequently sold A. J. Wilkinson Ltd (including the Newport Pottery Co. Ltd) to W. R. Midwinter Ltd in 1964. Midwinter were, themselves, absorbed by J. & G. Meakin Ltd in 1968 and then by Wedgwood in 1970. In the 1990s Wedgwood re-issued many of the classic Clarice Cliff shapes and patterns as limited edition collectors’ wares. Manufacture of the reproductions ceased in 2002 and they have since become collectible in their own right. There are numerous books and web sites devoted to the life of Clarice Cliff and her influence on 20th century English ceramic design. Anon. (1995). Clarice Cliff Price Guide (Francis Joseph Publications). Buckley, C. (1990). Potters and Paintresses: Women Designers in the Pottery Industry 1870-1955. (The Women’s Press Ltd). Griffin, L. (1996). Taking Tea with Clarice Cliff. (Pavilion Books Limited). Griffin, L. (1998). Fantastic Flowers of Clarice Cliff. (Pavilion Books Limited). Griffin, L. (1999). Clarice Cliff: The Art of Bizarre. (Pavilion Books Limited). Griffin, L, Meisel, L. & Pear, S. (1988). Clarice Cliff: The Bizarre Affair. (Harry N. Abrams, Inc.). Terlouw, W. J. (1994) Clarice Cliff, Museum het Princessehof. Watson, H. (1998). Collecting Clarice Cliff. (Kevin Francis Publishing). Wentworth-Shields, P. & Johnson, K. (1976).Clarice Cliff. (L’Odeon). These web addresses are all associated with ‘The Clarice Cliff Website’, copyrighted by Clarice Cliff Limited and in association with The Clarice Cliff Collectors Club. The website is authoritative and has comprehensive shape and pattern databases, histories, book reviews and an online forum Claricecliff ‘Online’. An Australian website devoted to A. J. Wilkinson/Clarice Cliff and managed by Greg Slater, the author of two authoritative books on Clarice Cliff and her work. The site includes an extensive image gallery of Clarice Cliff and A. J. Wilkinson patterns, articles and other material. ‘Melons’ was an early Clarice Cliff ‘Bizzare’ design. Here it is executed on a traditional Newport Pottery ‘Athens’ shape cup and saucer.